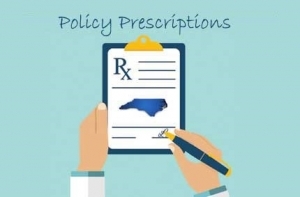 As the 2018 legislative session gets underway in earnest in this, its first full week, we hope you will continue reading our special series “Policy Prescriptions” researched and written by A. J. Fletcher Foundation Fellow Samone Oates-Bullock. Last week, Prescription #1 addressed food insecurity in North Carolina. Prescription #2 took on the issue of early childhood investments. Prescription #3 analyzed the challenge of funding school adequately and fairly. Policy Prescription #4 called for racial equity in education. Policy Prescription #5 called for tackling the issue of environmental racism in North Carolina. The Affordable Care Act (ACA) was enacted in 2010 in order to expand coverage, control rising healthcare costs, and improve the overall quality of healthcare in America. One of the major provisions of ACA was the expansion of Medicaid eligibility to low-income individuals with incomes at or below 138 percent of the federal poverty level ($28,676 for a family of three). This expansion would help to fill notable gaps in Medicaid eligibility and extend insurance coverage to low-income individuals. In 2013, North Carolina enacted legislation that prevents any state actor—including the Governor—from expanding Medicaid unless authorized by the General Assembly. As a result, hundreds of thousands of low-income North Carolinians are being left in the “coverage gap” — a place in which they earn too much to be eligible for Medicaid, but too little to qualify for marketplace subsidies that would allow them to purchase insurance in the private market. Closing the coverage gap would significantly change the landscape of healthcare coverage and access in North Carolina by providing coverage to more than 208,000 North Carolinians and, literally, saving thousands of lives.